The digital age has influenced everything from social interaction to transportation, and now, our homes! Check out these tech-savvy picks sure to make life a little bit easier on the home front. Illuminate your musical experience with this levitating Bluetooth speaker! Perfect for setting both the mood and the groove. Dustpan be gone! Sweep whatever mess that’s plaguing your perfect floorboards into the sensor area in front of the machine and, like magic, watch it disappear before your very eyes! Well. Into the vacuum of course. Your home security system now has wheels! Use your phone to do a clean sweep of the house and discover exactly what the doggo is up to, or what the weird noise was that you’re not too keen on checking out in person. 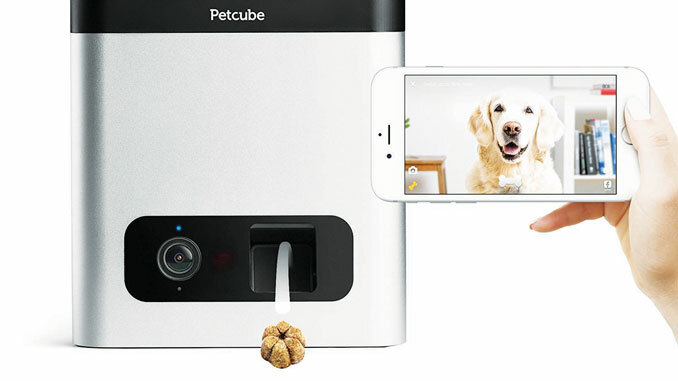 Check in on fido from the office with Petcube! Take photos directly from your phone, record video, or toss your four-legged fur baby a treat for not hopping on the couch! Go covert-ops with a monitor that’s directly linked to your outdoor light! Using motion-sensor technology that notifies you of activity outside your door, the camera lets you hone in on what’s going on outside, with the bonus of a microphone and speaker to converse with your potential visitor! Ever wonder exactly how much water is going down the drain while you shower? Amphiro displays your water consumption alongside a cute little polar bear on an ever-depleting iceburg that reminds you of your water use while showering. Coming to an empty wall near you! This video streaming robot brings the cinema centerstage to your home without all the funny smells and random popcorn bits stuck in your seat. Your new electronic best friend doesn’t just manage the thermostat. This room sensor helps to manage hot and cold spots in the vicinity, and has Amazon Alexa built right in! Breathe easy with Vitashield IPS technology, removing airborne particles as small as .02um from your home and creating a healthy environment your whole family will enjoy.